Irish science fiction writer Bob Shaw was born on December 31, 1931 in Belfast, Ireland. He’s particularly famous for the idea of slow glass, which slows down the passage of light for even years so that people can see the past, but he wrote many more stories in which he developed several other ideas. “The Monster of Peladon” is an adventure of the eleventh season of “Doctor Who” classic series which aired in 1974 featuring the Third Doctor and Sarah Jane Smith. It follows “Death to the Daleks”, it’s a sequel to “The Curse of Peladon” and it’s a six parts adventure written by Brian Hayles and directed by Lennie Mayne. China announced the activation of Beidou, its alternative to the GPS navigation system. The system is currently composed of ten satellites and provides positioning, navigation and timing services in China and surrounding areas. 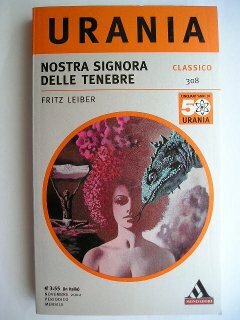 The novel “Our Lady of Darkness” by Fritz Leiber was published for the first time in 1977. Originally it was a shorter story titled “The Pale Brown Thing”, serialized in “The Magazine of Fantasy & Science Fiction” in 1974, which was later expanded into this novel. This longer version won the World Fantasy Award as best fantasy novel of the year. “The Curse of Peladon” is an adventure of the ninth season of “Doctor Who” classic series which aired in 1972. It’s a four parts adventure written by Brian Hayles and directed by Lennie Mayne.